Nothing enhances a kitchen quite like beautiful cabinets. Whether you had new cabinets installed this month or years ago, it’s imperative to keep them clean. 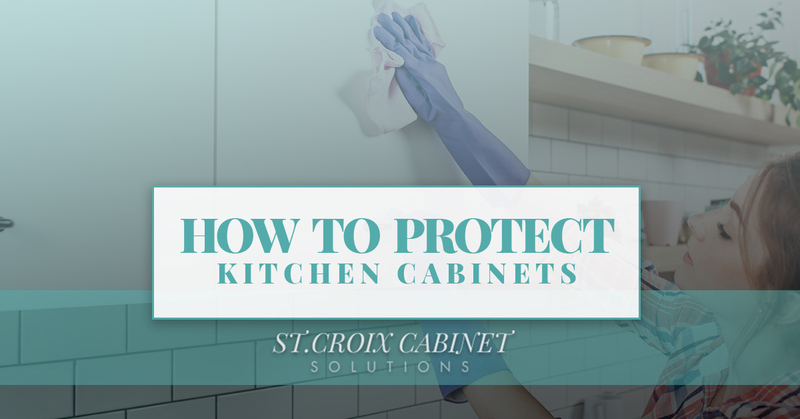 But with grease stains, food spills, and moisture spots, cabinet protection can certainly be a challenge. Line shelves and drawers – The last thing you want is dirt and grime mucking up the inside of your cabinets. That’s why we recommend lining shelves and drawers. There are several types to consider, including adhesive, cedar, felt, rubber, and cork. Pro tip: try using parchment paper for the cabinet under the sink and vinyl board cover liners in the silverware drawer. Get rid of buildup on doors – Have you noticed grime accumulating on your kitchen cabinet doors, especially around the handles? Not to worry. A combination of mild dishwashing liquid and water on a regular basis should do the trick. More serious grime may require you to remove the hardware. Just unscrew it and soak in warm, soapy water for a half hour. Feel free to scrub lightly with a soft brush. Lastly, allow the hardware to dry completely before replacing it. Steer clear of abrasive cleaning tools – You might be tempted to scrub away cabinet stains and other unsightly marks. However, this method could scratch or dull the finish. Our kitchen remodeling contractors routinely advise customers that the approach they must take depends largely on the material. At the bare minimum, wipe exteriors with a soft, damp cloth or damp microfiber cloth. See if you have success with a mixture of mild dishwashing liquid in warm water applied with a soft sponge. Then there’s the question, “How should I handle more stubborn stains?” Frankly, an undiluted all-purpose cleaner is probably your best bet. Wood – Maybe you have maple, birch, or cherry wood cabinets. These cabinets tend to be finished with either a tough, clear coating that seals and protects the wood or a painted finish. In terms of special cleaning considerations, avoid applying oil to sealed or painted wood cabinets. Many homeowners don’t realize that the oil won’t penetrate the finish and, in turn, will attract dust and grime. Laminate – As opposed to wood, stains on laminate cabinets can be removed with baking soda and water. The key, though, is to be gentle while treating the stain. What should you not do when cleaning laminate cabinets? The first is to avoid using baking soda on laminates with a glossy texture. Wondering how to repair deep scratches? Unfortunately, the only solution in such a situation is to replace the cabinet door. Thermofoil – What the heck is thermofoil? It’s made primarily of medium-density fiberboard and coated with a layer of vinyl. What makes thermofoil cabinet doors unique is that they usually have raised or recessed panel designs. In terms of maintenance, hide minor scratches using a repair kit made for such cabinets. Stainless steel – Do you have stainless steel cabinet boxes and doors? Here’s the thing with this type of cabinet material: water stains can be treated with a commercial spray. Just know that stainless steel with a smooth finish shows marks more than stainless material with a brushed finish. Thinking of polishing out scratches with a nylon pad? Make it a point to polish with the grain. Are you ready to finally have the kitchen of your dreams? Our team at St. Croix Cabinet Solutions can make it happen. For years, Hudson residents have turned to us for custom, beautiful work at an affordable price. Kitchen cabinet refacing – With some kitchen makeovers, cabinetry costs a fortune. That’s not the case at St. Croix. Should you choose to work with us, you could wind up saving up to 50 percent off the cost of new cabinets. We don’t cut corners with our work, either. In fact, we feature the highest quality products designed for cabinet refacing. Take your pick from 23 wood varieties in 95 grades and over 180 different wood and style combinations. Replacement cabinet doors – Is your kitchen lacking organization? Believe it or not, new cabinets could make a huge difference. Our experienced staff will work with you in determining if replacement makes the most sense for your situation. Rest assured that we will never pressure you with unnecessary sales tactics. Our goal is to find the best, most cost-effective solution for your project. Cabinet refinishing – It’s a fraction of the price to just refinish your cabinets. Should you go this route, you will have more room in your budget for a new floor, countertops, appliances, etc. Maybe you like the current style or layout of your cabinets. Perhaps your cabinets are in good shape and are free of major cracks, splits, or gouges. On the other hand, maybe you just want your project completed as quickly as possible. In any of these cases, cabinet refinishing makes a lot of sense. Summer is the perfect time to upgrade your cabinets. So why not get in touch with one of our premier design consultants? We are more than happy to walk you through the process and answer any questions. Contact St. Croix Cabinet Solutions to schedule a consultation.